Welcome to Jonanni’s Just Yogurt – Texas Homegrown Yogurt! 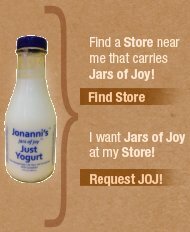 Jonanni’s is an artisan yogurt maker in San Antonio, TX. Our yogurt is pure yogurt, just milk and culture, no additives, sweeteners, or thickeners. We ferment the yogurt for 24 hours, decreasing the amount of lactose in the yogurt, making it an easily digestible yogurt. This yogurt meets the requirements of the Specific Carbohydrate Diet. Our milk comes from a local dairy farm, Mill-King, that pasture raises its cows. The herd grazes on grass, walks from pasture to barn for milking, and produces some of the most delicious milk around. The fresh milk is brought to our yogurt shop, pasteurized, fermented and bottled just for you. The milk is not homogenized and nothing is added. You are eating pure delicious yogurt, just as it is supposed to be.